Saving up for a down payment is tougher than ever as home prices rise faster than wages. But buyers are meeting the challenge through old-fashioned saving while also tapping into new and creative sources of financial help. For home buyers, scraping up the cash needed for a down payment gets a little tougher every time home prices increase, which is often these days. The combination of high prices and big increases has put home buyers in a tough spot, say financial planners and real estate brokers. Not only do buyers have to be prepared to save up in some cases tens of thousands of dollars, the amount needed to hit that magic down payment number is constantly going up. Still, depending on whether they are first-timers or established home owners looking to move up in an extremely tight market, home buyers can face very different challenges in coming up with that cash. However, whether it is a buyer's first home or her third, all must work though two key questions. First, and most importantly, they need to come up with a plan to pull together the cash they need for that down payment, either from savings or, as is increasingly the case, a combination of savings and other sources, experts say. But second, buyers need to set a target on how much they plan to put down. No arbitrary number, this will make a big difference over the long-run in how much they pay out over the coming years in monthly mortgage payments and interest. "I see buyers putting down around 5%-10%, especially millennials," says Ashley Foster, a certified financial planner in Houston and founder of NEXT:Gen Financial Planning. "The disadvantages of such a low down payment are a higher monthly mortgage payment, a higher mortgage balance, and a private mortgage insurance premium." Of all the house hunters out there, first-time buyers have it the toughest right now. Rents are rising as fast if not faster as home prices in some cities. For first time buyers trying to make the jump from tenant to homeowner, that can make coming up with the money for a down payment even more difficult. First time buyers tend to be younger and have fewer resources to draw upon. Unlike established homeowners who are looking to move up into something bigger, they can't roll the gains from their first home into the second. For first-time buyers, finding a way to save up as much money as possible is crucial. Foster, the certified financial planner in Houston, suggests buyers should first set a price point at which they hope to buy and then come up with a savings plan. That means setting up an automatic deduction from your checking to your savings account and stashing away as much as 2% to 5% of each pay check. "If you can automate your savings, then in no time you will have the required down payment needed to purchase the home you want," Foster says. It is important to plan ahead, though, when saving for a home: Foster suggests a minimum of two years, provided there is no major change, of course, like the arrival of a child, which requires more immediate action. To bring in extra cash, consider picking up a second job as well. Susus have long been a non-traditional way of pooling money for savings or other major purposes. Another option is to borrow some of the money from family or friends, obviously not an option for everyone. But it doesn't necessarily have to be a loan. Equity sharing is another idea that is gaining currency in some hot markets where a booming economy and a shortage of homes for sale are driving up prices, notes Sam Schneiderman, principal broker of the Greater Boston Home Team. Under this option, the home buyer promises to give a stake in the future equity of the home to parents, friends, relatives, or whoever is helping put up the money for the down payment. The money is then repaid out of whatever gains the buyer reaps when she sells her home down the line. "It's almost impossible to save at the rate that property prices are going up," Schneiderman says. By contrast, veteran homeowners looking to move up to a larger property face a different challenge, experts say. If they have owned their home for a while and are in a thriving real estate market, they will have enough money, and maybe then some, to put down a substantial down payment. But they can't access that equity until they sell their home. And in markets like Boston or San Francisco or Seattle where there are more buyers than listings, selling your house without another home lined up can be very risky indeed. Faced with this dilemma, some move-up buyers are turning to bridge loans to come up with the down payment on a new home, says Catherine Valega, a certified financial planner and financial consultant at Rockland Trust, a Boston-area bank. The loans, offered by banks and other lenders, provide the cash the move-up buyer needs to land that next home without first having to sell. The move-up buyer later repays the bridge loan from the gains generated by the sale of her first home, Valega notes. Still, while they are often at different stages in life, first-time and move-up buyers face a common challenge of how much to put down on a house. There are obvious and some not-so-obvious reasons why putting more money down can provide greater, long-term benefits. A substantial down payment can free a home buyer of having to pay for private mortgage insurance, an added monthly payment on top of a mortgage, Foster notes. It can also win a home buyer a lower rate, leading to tens of thousands in interest payment savings over the life of the loan. 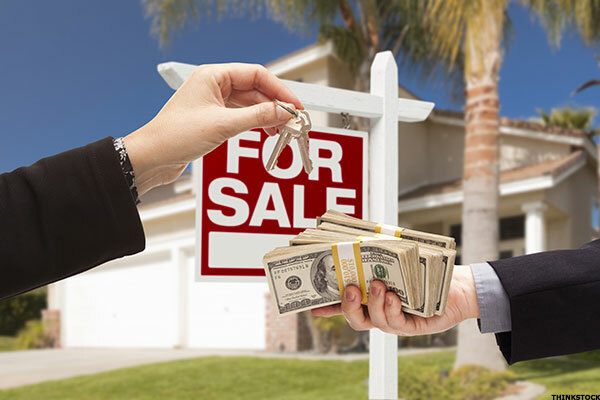 And in tight real estate markets, the buyer with the higher down payment often is the one who wins out in a bidding war, providing the seller more confidence that the bank will approve the buyer's mortgage and that the deal will close, according to Schneiderman, the Boston-area real estate broker. But for many first-time buyers, simply coming up with 10% - or 6% or even just 3% - can be a challenge. Even so, it's probably better for the buyer to push ahead and land that first home so she can start building equity and stop paying rent, especially at a time when rents in a number of cities are now higher than mortgage payments, says Rockland Trust's Valega. "Rentals here in the Boston area are so expensive it can still make sense," Valega notes. "While your chances of building true equity are pushed off for decades when you put so little down, by locking in a mortgage you avoid the increase in rental rates," she notes.